The FlexStream AK500S point-to-multipoint system enables the transport of high-quality, high-bandwidth Ethernet services over bonded copper pairs. It provides 100 Mbps of high-bandwidth per AK525LC / AK525LCPA line cards and up to 800 Mbps per AK626LC line cards enabling the delivery of carrier-grade service throughout service provider networks (12 Kft/ 3.7 Km) and beyond. The AK500S system consists of the AK500S multi-service shelf, line cards and management/uplink cards. The AK500S can support 16 line cards per shelf and is environmentally hardened for any deployment scenario. The platform adheres to MEF9, MEF14 and CE2.0 recommendations. High speed Ethernet services do not have to be limited to customers served by fiber. With the AK500S, service providers can provide high-quality, scalable Ethernet services to all customers throughout their networks using existing copper loops. The AK500S is a standards-based multi-pair DMT platform with support for MIMO on DMT and VDSL2/ADSL2+ to provide superior performance and reliability in comparison to SHDSL multi-pair copper products on the market. Along with meeting copper loop standards such as ANSI T1E1.417, which enables the AK5000 Ethernet services to co-exist with other services in a binder, the products are compliant with IEEE 802.3ah EFM, IEEE 802.1 and 802.3 LAN standards and Metro Ethernet Forum MEF9/MEF14. Utilizing Positron’s breakthrough multi-channel signal processing DMT + MIMO techniques embodied in both the hardware and software, the AK525CU can transport more bandwidth over longer distances on fewer pairs than SHDSL or T1 IMA copper bonding technologies. When equipped with the 12-pair AK626LC line card, the AK500S delivers up to 100 Mbps per copper pair using VDSL2 with Vectoring and G.INP impulse noise protection. Each AK626LC line card handles 12 copper pairs via up to 4 bonding groups each made up of 2 to 8 pairs. With VDSL2, it is no longer required to rely only on fiber to deliver Business Ethernet services to small and medium businesses looking for up to a few 100 Mbps of bandwidth. Using the existing copper infrastructure yields the best possible Return on Investment over other technologies. The AK500S and its copper line cards are designed to dynamically compensate for individual copper pair failures. If a copper pair fails, the AK525LC and AK626LC line cards of the AK500S automatically adjust the other copper pair margins to compensate for the loss. This feature allows any pair to protect all the pairs in a bonded group, without the need to double the number of copper pairs used. 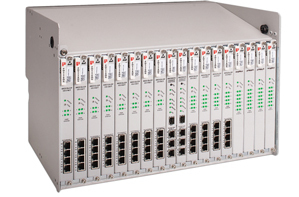 When equipped with a pair of redundant AK500CC Common Controller module, the AK500S extends the link aggregation capabilities of the AK500CC with active redundancy to preserve the full available upstream bandwidth should there be an issue with any of the upstream links feeding into the AK500S. The AK525LCP is designed to remotely line power an AK525RU Remote Unit. The power is injected on the same bonded copper pairs that are carrying data. There is no performance impact on the data when the AK525RU is line powered by the AK525LCP. The AK500S and its copper modules can be securely managed by Positron`s Element Management Software (AKEMS) and AktinoView (GUI software) or via a Command Line Interface (CLI). The AK590CC module of the AK500S interoperates with industry standard Network Management Systems providing comprehensive performance monitoring for both the transport physical layer and Ethernet.